As you can tell by the cover, the Scottish band Chvrches guest stars in this issue. I’ll admit that this was my main reason for reading it. I love Chvrches. They are one of my favorite bands to see live and their music has gotten me through many a road trip. This isn’t the only tie the band has to comics— The Wicked + The Divine artist Jamie McKelvie lent his talents to make tour posters for them as well as the animated music video for their song “Bury It,” and the variant cover to this very issue. 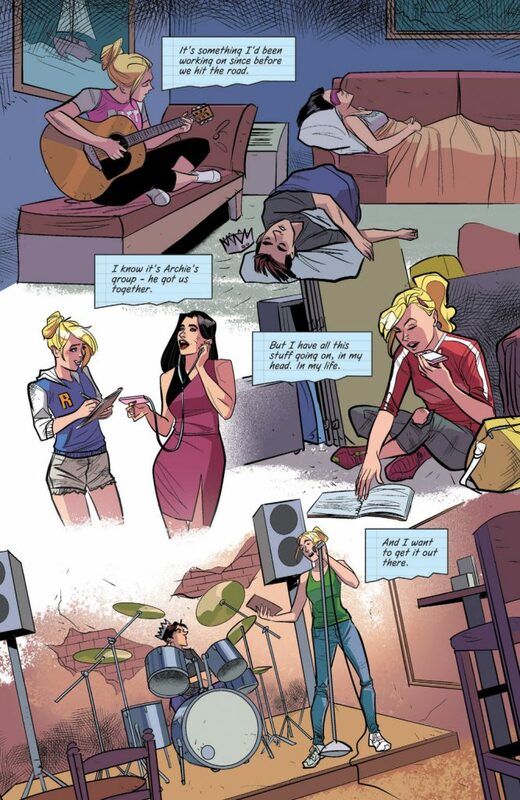 Thanks to Betty’s exposition told via a journal entry, we know The Archies are in Boston. Betty catches us up on the band’s adventures in touring, and now they have their first radio spot. 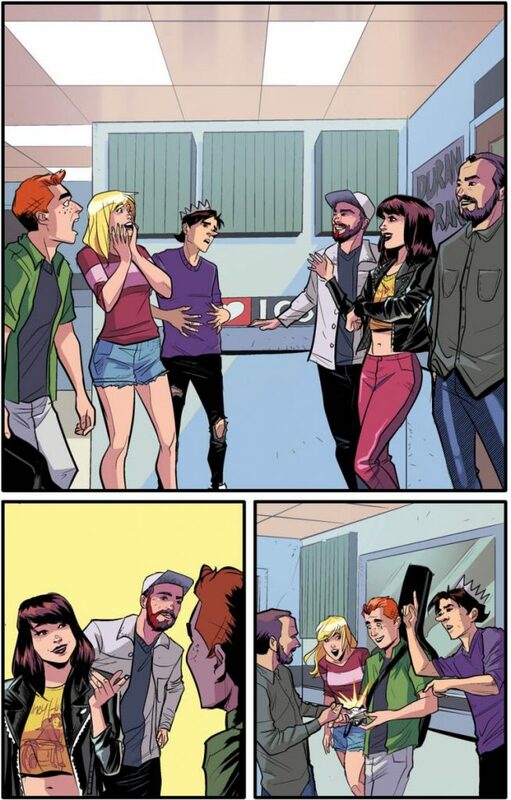 The radio DJ seems charmed by Archie’s proclamation that he’s singer, guitarist and the one the band is named after. By charmed, I mean she immediately dismisses him and focuses in on Betty. Betty has been using that notebook for more than just chronicling the band’s activities: she’s also been working on a song. Joe Eisma has a special way of drawing facial expressions. In a mostly silent scene, we see Betty struggle with and then decide to mention her song, Archie’s reaction to it and her reaction to him. There’s an entire conversation in these faces. In a nice sequence, we see images of her working on it with the help of everyone but Archie. So of course, Betty’s song takes him by surprise. Not that I’m on Archie’s side here but I wouldn’t choose to play a new song that most of the band is unfamiliar with my first time live on air. But that’s just me. Betty seems to have no problems with it. Neither does Jughead, who seems excited. The DJ is definitely for it. Archie, on the other hand, is more reluctant. “It was the best moment,” Betty writes. “And kind of the worst too.” Worst because it creates a bit of conflict within the band. And this is when Chvrches makes their entrance. Not only have Chvrches seen them perform, they like their work. Kudos to The Archies! Alas, the happiness of having a band you love recognize you can only last so long. They part ways with Chvrches and then each other as Archie goes out alone to angst over what just happened. Meanwhile, Jughead and Betty find that their bad luck continues and they no longer have a place to live. Archie is conflicted. On one hand, Betty is his best friend and he wants to feel happy about her song. On the other, this is his band and his songs that they play. 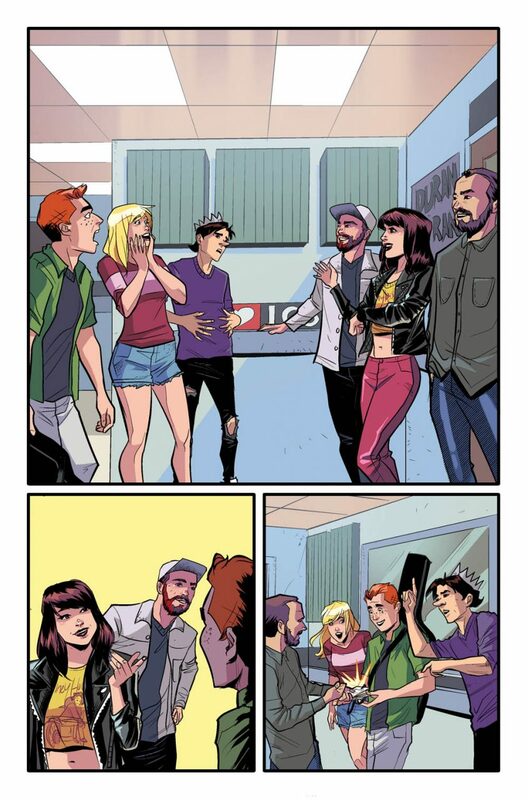 He ends up meeting Chvrches again in a comic book and record store of all places. (Could this get any more hipster?) They help him realize that he shouldn’t feel threatened by Betty. Ultimately, the story emphasizes above all that they are good friends. It’s very feel-good, and that’s how I would describe this entire issue. 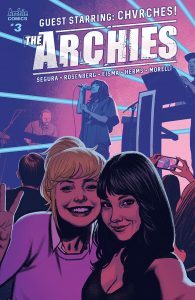 Alex Segura and Matthew Rosenberg give us a cute interlude with a real-life band I happen to love making an appearance to help Archie find his way and give The Archies some much need confidence. Eisma’s art and Matt Herms’ colors make everything look fresh and interesting. 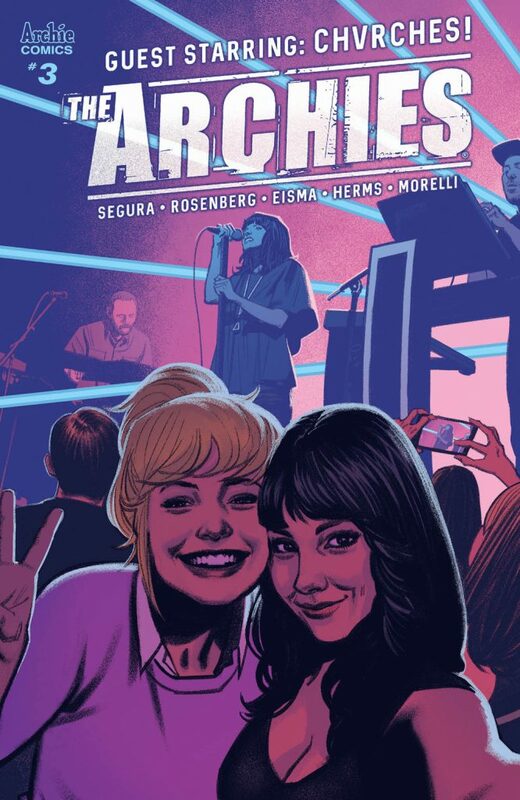 It’s an issue worth picking up if you like The Archies or just want to see Chvrches hang around in comic book form.